Scissors? Check! Glue? Check! This worksheet has school supplies and math practice. 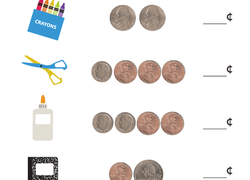 Kids see key supplies for school, and groups of coins representing price.